The statements of the firms on LearnDoubleEntry.org can now be customized. The code of the application has been improved to allow for the definition of different statements. It is possible, this way, to call your Income Statement in a different way (say, for instance, Profits and Losses), or to prepare Statements for entities like US not-for-profit organizations, where you need three sections of the Statement of Activities, like Changes in Unrestricted Net Assets, Changes in Temporarily Restricted Net Assets, and Changes in Permanently Restricted Net Assets (we'll come to this in a next blog post). Also, the name of the statements are now internationalized the same way the name of the accounts are. an Income Statement, with Profits and Losses. Control Accounts are the ones for which you don't know in advance whether the outstanding balance will be in debit or in credit. Common examples are bank accounts and Value Added Tax control account. In the final Financial Statement the amounts of this accounts will be posted to the correct destination, but if you want to have a look at it before, you will find the amounts in this statement. 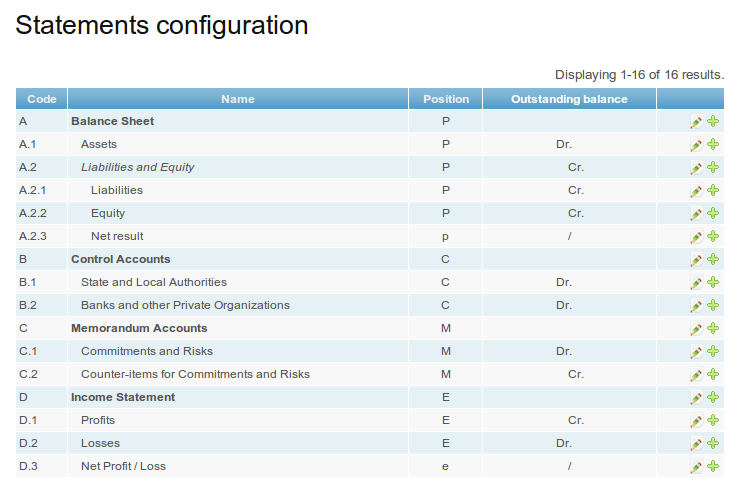 Memorandum Accounts are the ones where you keep track of Committments and Risks the firm faces. Every "statement" is characterized by an uppercase letter. The same letter, but lowercase, is used to specify the accounts that are used for closing entries. Since everything is customizable, you might try to use a different configuration. In case of problems, just let us know.